Note that an audible warning device is a legal requirement for all vehicles, and strident horns sounding fluctuating notes are allowed on emergency-service vehicles and police cars only. Adjusting screwand locknut. Double liveterminal forconnection to asecond horn. 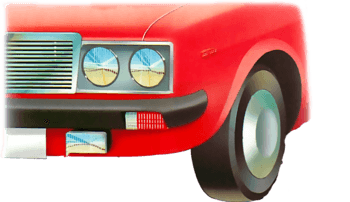 Cars are usually fitted with a high-frequency (HF) or windtone horn as standard equipment, normally located behind the front grille. A vibrating diaphragm makes the sound in both types. The diaphragm is moved by an electromagnet and contact breaker, like that of an electric bell. In an HF horn, a resonator plate is fixed to the diaphragm to amplify the sound. In a windtone, the diaphragm makes air vibrate in a trumpet, giving a lower pitched and more musical sound. The length of the trumpet fixes the pitch. In some cars there is a pair of wind-tones, tuned to give two notes. They .are marked for low notes and 'H' for high. A third type of horn, the air horn, uses a compressor, and is fitted only as an accessory. It has a loud and distinctive note and is sold with fitting instructions. The stalk is wired to amulti-pin connector -see that it is clean and agood fit. Clean the spring contacts ofa steering-wheel hornbutton. 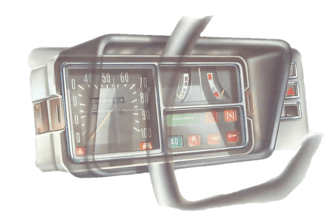 The horn may be operated by a stalk on the steering column or button in the centre of the steering wheel. If the horn fails, check whether the fuse is sound (See Checking and replacing fuses). If it has blown, fit a replacement and check the horn again. If the fuse is sound, or if a replacement fuse blows, there is a fault in the circuit or the horn itself. Because they are low down at the front of the car, horns often get wet and dirty, and the connections may rust. Usually the horn is earthed through its metal body and the mounting bracket. Rust here or in the connections can break electrical contact, and is the most frequent cause of horn failure. Remove a failed horn and clean it by brushing or wiping - do not immerse it in a liquid. While the horn is removed, check it by connecting it directly to the battery. Place the horn with its metal casing (or a terminal if there are two) against the battery negative terminal. Clip a test lead between the other horn terminal and the other battery terminal. If the horn works, refit it. If not, repair it if possible or replace it. 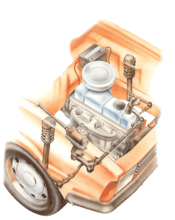 If, however, the horn does not work when refitted, look for other connections that may be loose or broken - especially the horn button or the multiple switch on the steering column. Test that power is reaching the circuit by connecting a test lamp between various points and earth, then pressing the horn button. If there is power, the lamp will light. If power is reaching the circuit, the fault may be a break in the wiring between the fuse box and the switch. Find the switch input terminal by connecting a test lamp between each of the terminals and earth; the terminal that lights the lamp is the input terminal. Connect the test lamp between the switch input terminal and earth. If there is a break in the wiring, it will not light. If it lights, the horn-button switch may be faulty. Connect the test lamp between the output side of the switch and earth, and press the switch. If the test lamp does not light, the switch is faulty. Often the horn-button switch forms part of a multiple-function stalk switch on the dashboard or steering column, and the complete switch must be replaced. If the fault is in the horn itself, you may be able to dismantle the horn and find what is wrong. Cleaning the contact breaker might work; or there might be a broken or disconnected wire inside. Horns that are riveted together cannot be dismantled easily, and must be replaced with new ones. Most types can be obtained from garages, accessory shops, or auto-electricians. If you want to change the sound of the horn, there is sometimes a slotted adjuster in the centre of the resonator disc at the front. Turn it until you get the sound you want. Do it in a deserted place to avoid causing a nuisance. If there is a fault in the horn, adjusting the contact breaker is often the remedy. The adjuster screw is to one side on the front or back. Ask a helper to sound the horn while you unscrew the adjuster. When the sound stops, turn the screw back a quarter turn. If you are fitting a second horn, connect the two live terminals together. If necessary, earth both horns. Disconnect the battery and the electrical connections to the horn. Unbolt it from its brackets - use a penetrating oil if the bolts are badly corroded. Clean the bracket, bolts and connections, and also the horn itself - unless you are fitting a new one before reassembling. One way to change the sound of the horn is to fit a second horn with a contrasting note alongside it. However, the current capacity of the cable feed and switches must be sufficient to carry the extra load. Generally this rules out wiring an extra-powerful or commercial vehicle horn into the existing system. If in doubt, consult a service manual or your local dealer. If you can fit an extra horn, mount it either beside the existing one or in the corresponding place on the other side of the car. Use 28/30 cable to connect the input terminals of the two horns together, and the two output terminals if there are any. If earthing is through the horn body, make sure there is a good earth connection between the mounting bolts and the mounting point.